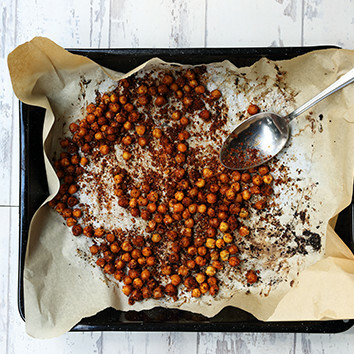 Crunchy, roasted chickpeas make a delicious, healthy snack. This recipe is really quick and simple and you can make it your own by adding different herbs and spices or even different oils before roasting. Pre‐heat your oven to 180°C. Drain, rinse and dry your chickpeas. Then place them in a lined baking tray. Drizzle with some olive oil, then sprinkle on your Bioglan Superfoods Chia + Flax, spices, salt and pepper. Use a spoon to mix until all the chickpeas are coated, then place the tray in the oven for 30‐40 minutes, until the chickpeas are slightly golden, tossing twice in the middle. Remove, allow to cool then store in an airtight container for 3‐4 days. Enjoy!